A fund-raising event is being held in aid of Benaiah near Mintlaw. AOG Central will launch into Easter week with a heart-stirring fund-raiser next Saturday, March 28. 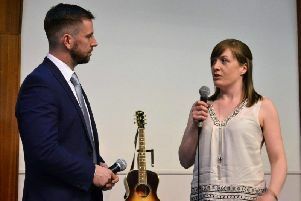 The Fraserburgh church is hosting ‘Hosanna’, an inspiring evening of songs and stories, to raise funds for local addiction recovery centre, Benaiah, where women and mothers with children complete the faith-based programme, Teen Challenge. The year-long course is based on Christian principles and is balanced between classroom studies and practical work duties, which equip students with a range of skills in, for example, cooking, gardening, domestic DIY, administration, horse livery and business entrepreneurship. After completing the programme, graduates continue to receive support from the charity in establishing homes, career and further education opportunities, social networking and finance management. Commenting, AOG Central’s Sharon Sim said: “We’re thrilled to be hosting this fundraiser over the weekend of Palm Sunday, which marks the day Jesus entered Jerusalem. “‘Hosanna’ – a shout of praise and a cry of deliverance and salvation – is what the people shouted to Jesus as He passed by, so what better name for an event which will ultimately help deliver women from the horrors of addiction. “The devastation that drug addiction has on an individual and their family is close to my heart, so I am extremely pleased that the church is able to support Teen Challenge, which does tremendous work encouraging hurting people to live clean, free lives. ‘Hosanna’ will take place from 7.30pm on Saturday, March 28, at AOG Central on Queens Road. Admission is free, with an offering being taken up for the work of Benaiah, which is located near Mintlaw. Tea, coffee and refreshments will be served to attendees after the event.